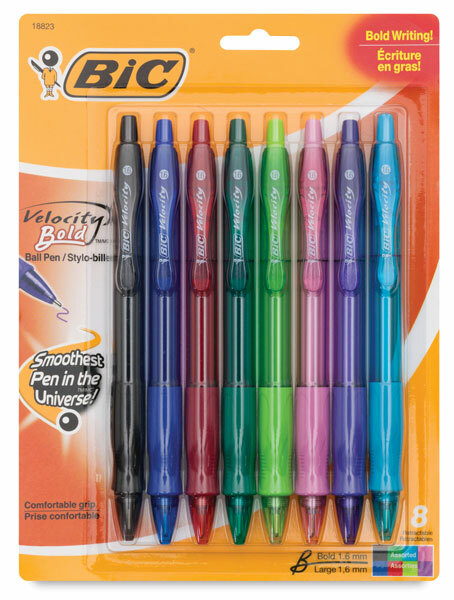 The Bic Velocity Bold Ball Pen has a bold, retractable 1.6 mm point and Easy-Glide System ink to create a smooth writing experience. This pen writes in bold, vivid lines and has a rubber grip for comfortable writing. 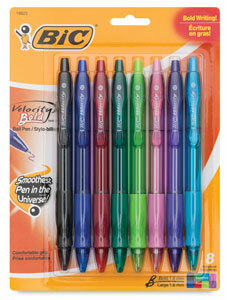 This set includes eight pens, one each of Aqua Blue, Black, Blue, Dark Green, Lime Green, Pink, Purple, and Red. ® BIC is a registered trademark.® Velocity is a trademark.